Size of this preview: 800 × 530 pixels. Other resolutions: 320 × 212 pixels | 4,040 × 2,675 pixels. 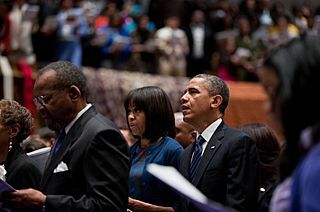 Description: United States President Barack Obama and First Lady Michelle Obama attend a church service at Metropolitan African Methodist Episcopal Church in Washington, D.C., on Inauguration Day, Sunday, 20 January 2013.